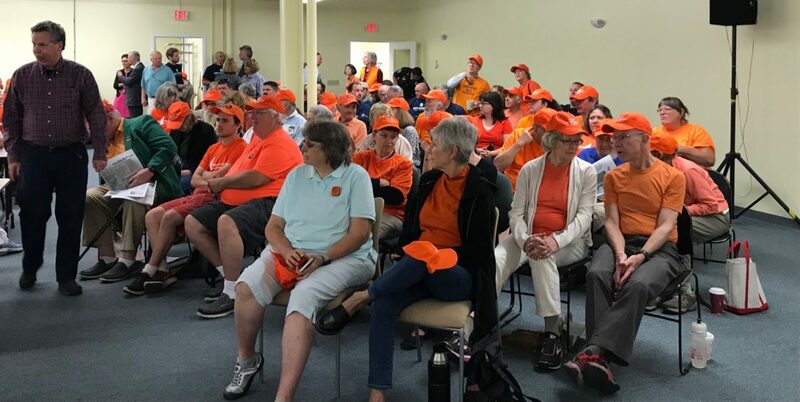 The hearing room at 49 Donovan St. in Concord filled on May 24 for the Site Evaluation Committee to hear Northern Pass' motion seeking reconsideration of the denial of its application to build a 192-mile high-voltage powerline from Pittsburg to Deerfield. Sign up for InDepthNH.org’s free weekly newsletters here. CONCORD — State utility regulators voted 7-0 on Thursday to reject a motion to reconsider their decision turning down the $1.6 billion, 192-mile Northern Pass Transmission project. Project developer Eversource wanted the Site Evaluation Committee to vacate its February decision denying the application, reopen deliberations and consider conditions the utility said would mitigate its concerns. Eversource said it is not giving up the fight for what they believe is a needed project. But opponents of the project hailed the decision saying Eversource should abandon the proposal. He noted the company failed to meet its burden of proof because the project as proposed would have unreasonable adverse impacts. But the company said they are not going to give up and are seriously considering taking the decision to the Supreme Court. “We’re disappointed, particularly in light of the Supreme Court’s ruling this week that reiterated the emphasis that state law places on lowering costs for customers,” said project spokesman Martin Murray. An appeal to the Supreme Court is expected to take about a year. Northern Pass officials had hoped to have the transmission line in service by the end of 2020. The SEC turned down the project saying Eversource failed to meet its burden of proof that the project to bring 1,090 megawatts of Hydro-Quebec electricity to New England wouldn’t interfere with the orderly development of the region. The committee said Eversource and its experts failed to provide enough credible evidence for the committee to make an informed decision on the project’s impact on property values, local businesses and tourism and on the changes in land use. Eversource claimed the committee did not consider proposed conditions that could have mitigated concerns, but SEC chair Martin Honigberg said the committee could place conditions on the project if it were going to approve a proposal. In this case, he said the committee was not given an adequate base of information to determine what could be done to address the problems. SEC member and Department of Business and Economic Affairs representative Christopher Way said the studies done by the company’s experts on tourism and property values were often based on work done by others and led to faulty conclusions. In Thursday’s deliberation, the SEC found little merit to Eversource’s request to continue deliberating the four criteria an applicant must meet for approval. The committee reached conclusions on two of the four criteria, but did not continue after determining the applicant failed to meet its burden of proof on orderly development. Honigberg said it probably is better administrative practice to continue deliberating on all four criteria, but is not not required according to statute. To approve a project, the committee would have to determine all four criteria are met, he said, but not if the project is denied because it fails to meet one of the standards. “I don’t believe this motion should be granted,” he said, and the committee voted 5 to 2 not to reopen deliberations on the remaining standards. The committee also rejected Eversource’s claim that the committee’s decision was arbitrary and ad hoc, which Honigberg said was a claim made for lawyers in anticipation of taking the case to the Supreme Court if the committee denies the reconsideration motion. The claim allows Eversource to determine whether the committee rules properly implement statute, if they are clear enough for companies, and if the committee applied the rules fairly, he said. Honigberg said he largely agreed with Counsel for the Public’s response the decision that the applicant failed to meet its burden of proof is not vague on its face or as applied by committee. “The applicant had within its own power to make the case it needed to make and it failed,” Honigberg said. Eversource also claimed the committee gave undo weigh to the opinions of regional planning commissions and local municipalities, using phrases not in statutes like “tipping point” in its ruling and misconstruing or misapplying evidence. Way noted the views of the host communities is overwhelmingly against the project, and said the applicant is required to interact with those communities but did so in a passive way. “There was not a lot of information coming to us,” he said, from Eversource. Honigberg said the statute directs the committee to consider municipal views. Eversource also claimed the written order would indicate there were deliberations conducted outside the public process, but several committee members said that is how the two-step decision-making process works: the committee deliberates in public and then the order is written to reflect that decision including the evidence, laws and rules that may not be cited in public. The committee also rejected a motion for committee members Kathryn Bailey and Patricia Weathersby to recuse themselves from the deliberations now and in the future, but both members refused and said they were quoted out of context in a motion filed by the International Brotherhood of Electrical Workers and Coos County Business and Employers Group. They said their comments did not reflect any bias or animosity and were part of the public deliberation process. The SEC issued a 7-0 oral order Feb. 1 and Eversource asked the SEC to reconsider its decision on Feb. 28. The SEC then decided March 13 to suspend its oral order saying it would entertain motions for reconsideration after the written order is issued, which it was on March 30. Eversource filed April 27 seeking reconsideration. Northern Pass was proposed in 2010.